Hungry? At the Walt Disney World® Resort, you can travel the world right from your dinner plate, with an astonishing array of restaurants and eateries. Savor modern African cuisine at Jiko – The Cooking Place. Dine in award-winning, world-class opulent elegance at Victoria & Albert’s. Breathe in the delightful aromas of Via Napoli. Dine on the Polynesian-inspired menu at ‘Ohana . Celebrate Octoberfest at the Biergarten Restaurant. Toast an ale with friends at the Rose & Crown Pub and Dining Room. From sizzling steaks to succulent seafood, there’s something to please every palate…even the little tykes. Grab a quick bite on the go; relax and savor the ambiance of specially-themed restaurants; enjoy a rousing Dinner Show; or dine with your favorite Disney Characters. Just remember to save room for those yummy desserts! Disney’s Resort Hotel packages let guests customize their vacation package and choose the recreation, ticket, and dining options to create a dream vacation. Guests can choose vacation options that will save time and money; creating a truly personalized vacation! 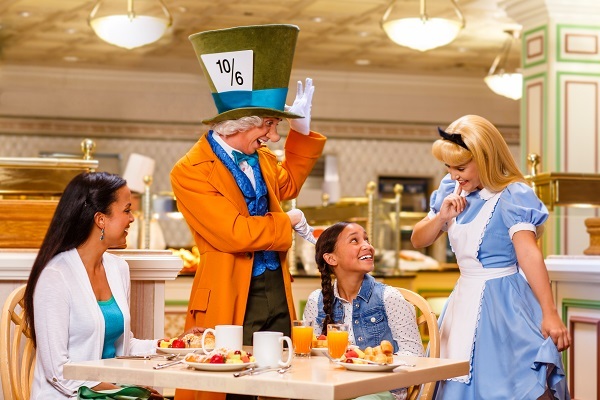 In addition, when guests choose a Resort Hotel Package, they can add one of Disney’s Dining Packages which offer guests the opportunity to save up to 20% on Disney Dining. It also offers guests the opportunity to pay for their dining in advance and experience a more “all inclusive” vacation. Disney Resort Hotel Plus Quick Service Dining – offers 2 Quick Service meals, 2 Snacks per person per night of the package stay, plus 1 Resort Refillable Drink Mug per person, per package. Disney Resort Hotel Plus Dining – offers 1 Table Service Meal, 1 Quick Service Meal and 2 snacks per person per night of the package stay, plus 1 Resort Refillable Drink Mug per person, per package. Disney Resort Hotel Plus Deluxe Dining – offers 3 meals (Table Service or Quick Service) and 2 snacks per person per night of the package stay, plus 1 Resort Refillable Drink Mug per person, per package. This package offers the most opportunity for savings and also includes the most food. Using one of Disney’s dining plans is very convenient, as dining plan credits are loaded onto a guests’ Key to the World Card. You simply present their card to the cast member to “pay” for the meals using the dining plan, and dining credits are subtracted from the available credits. Meal usage is tracked electronically and receipts indicate remaining meal credit balances. Dining plans are especially convenient for groups traveling together or parties with older children who may want to have some independence during the vacation. Each guest has access to their meals by using their Key to the World Card. Choose the plan that works for you and choose how to use your dining credits. Use meals and snacks credits in any combination. Use three meal credits one day, one meal credit the next and only snacks the third day. You decide! Most of the restaurant locations in Disney Theme Parks, Resorts and Disney Springs accept the Disney Dining Plans so planning is easy. The cost of Disney dining plans are included in a package price and paid for before you arrive. Arrive at your vacation destination with the majority of your vacation expenses paid in advance. The cost of the dining package is included in the package price and the entire package is paid for before the guest arrives. Dining can be one of the more expensive components of a vacation and guests using one of Disney’s dining plans can save up to 20% on the cost of dining. Explore all the dining plan to find one that works for you.